Shay Marks earned his second win of the 2016 PBR Canada season on night two in Prince Albert. PRINCE ALBERT, Saskatchewan -- Sunnybrook, Alberta's Shay Marks earned his second win of the 2016 PBR Canada season on Saturday night at the Clunie-Cooper Memorial PBR. Marks won in Tofield three short weeks ago and sat third in the PBR Canada standings coming into this weekend. On Saturday night, the young gun put up a score of 86.5 points on Wanderlust from Girletz Rodeo Stock in the first round. Adding that to the 80 point effort in which he clung to King Pin from the Wild Hoggs in the finals, it meant Shay Marks had won the same night as he did in PA last year once again. For his efforts, Marks adds another $3,931.94 to his season earnings putting him well past the $10,000 mark in a few short months. On the world stage, he could rank as high as 49th when the next set of standings hit the wires. Last year the top 50 were invited to Las Vegas for Last Cowboy Standing. Shay could get a call about Tuesday, depending how the standings shake down in Canada, he could be the new number one here. North Dakota's Nathan Schaper earned some much needed points in Prince Albert. Schaper put together a pair of scores to finish second on the night for 30 points towards the PBR world standings. Depending on how things shook down this weekend in Uvalde, TX he could rank as high as 34th. Saskatchewan man Tim Lipsett won the first round of the evening with an 87 point effort on Open Season from the Wild Hoggs. Lipsett would not cover his final round bull but ended up with 20 world points and $1,887.70 in earnings. 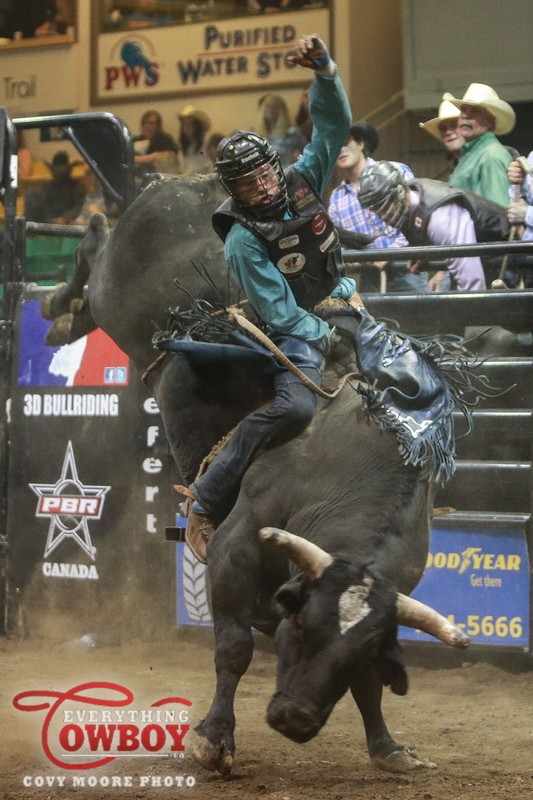 Rounding out the top six were British Columbia's World Finalist Ty Pozzobon, Jordan Hansen and the man who Shay Marks now is in a tight race for number one, two-time Canadian Pro Rodeo Champion Dakota Buttar. The first ever ABBI sanctioned Classic took place in Canada as part of the Clunie-Cooper Memorial PBR. Young Money Cattle Company/Hy-Kik Ranch's 124 Story of the Stars took the title for $4,000 in earnings. The top Futurity and Classic bulls in Canada make their way to Las Vegas this fall for the first time. The following are the in progress results from day two of the Clunie-Cooper Memorial PBR in Prince Albert, Sk at the Art Hauser Center on May 7th, 2016. Round one: 1. Tim Lipsett on Wild Hoggs' 193 Open Season, 87, $663.00; 2. (tie) Shay Marks and Ty Pozzobon, 86.5, $414.37 each; 4. Jordan Hansen, 83.5, $165.75; 5. Nathan Schaper, 78.5; 6. Dakota Buttar, 76.5; no other qualified rides. Finals: 1. Nathan Schaper on Vold Rodeo's 825 Feeling Blue, 81 points, $663.00; 2. Shay Marks, 80, $497.25; no other qualified rides. Aggregate, total money and points earned: 1. Shay Marks, 166.5 points on two bulls, $3,931.94, 60; 2. Nathan Schaper, 159.5, $2,909.82, 30; 3. Tim Lipsett, 87 points on one bull, $1,887.70 20; 4. Ty Pozzobon, 86.5, $1,252.32, 15; 5. Jordan Hansen, 83.5, $694.30, 10; 6. Dakota Buttar, 76.5, $373.85, 5. Shay Marks rides Wild Hoggs' King Pin to win the Clunie-Cooper Memorial PBR in Prince Albert, SK on May 7th, 2016. Photo by Covy Moore. Official ABBI Classic results from May 6th and 7th, 2016 in Prince Albert, SK as part of the Clunie-Cooper Memorial PBR. 1. Young Money Cattle Company/Hy-Kik Ranch’s 124 Story of the Stars, 89.75 points, $4,000; 2. Flying High Rodeo Co.'s X220 Twenty to Life, 87.5, $3,000; 4. 3. Pozzobon Cattle/Prescott Bucking Bulls/Patten's 225 Big Tymer, 87.25, $2,000; 4. Two Bit Bucking Bulls' 292 Pain Killer, 86, $1,000. Next up on the 2016 PBR Canada schedule is the Nipawin RONA PBR in Nipawin, SK on Friday May 13th.